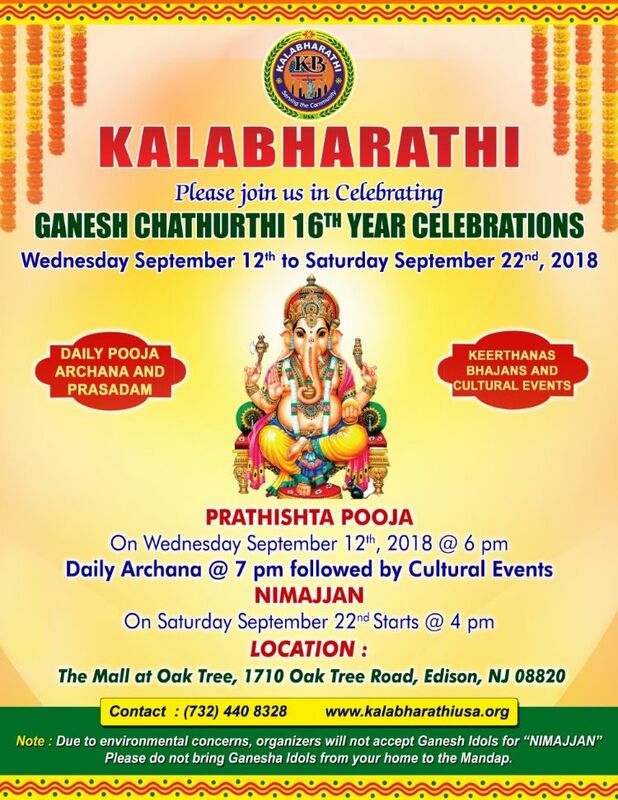 Edison, New Jersey: It is with great joy and honor that we extend our 16th annual invitation to join in the celebration of 11-Day Ganesha Chaturthi festival, said Kalabharathi in a press note. Starting on Wednesday September 12th with Prathishtha Pooja at 6:00 pm, daily festivities will include archana, prasadam, bhajan and cultural programs. For the last 15 years, your participation was our motivation in celebrating the Ganesha Chaturthi as a community festival. We hope that you will join us again in this year - as a volunteer to work with us, or attend the daily festivities with your family and friends, said the Kalabharathi Team.